Carter joins Colonel Emerson and his crew aboard the Odyssey, but their mission is compromised when they are ambushed and boarded by forces of the Lucian Alliance. Their leader, Anateo, orders Carter to disable the ship's subspace beacon, and when she refuses, Emerson is killed. SG-1 pursues the ship's transponder signal, only to find that it has been removed to lure them to a nearby planet where Daniel and Vala are also captured and brought aboard Odyssey. 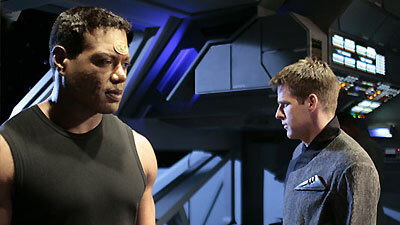 Mitchell and Teal'c devise another plan to rescue the ship and its crew. Mitchell will use the Reol chemical as a disguise to impersonate Kefflin, Netan's trusted lieutenant, and infiltrate the organization. There has been mounting dissent within the Lucian Alliance over Netan's leadership, and Anateo believes his capture of the Odyssey and SG-1 will guarantee Netan's downfall, leaving him in command. As Carter, Daniel, and Vala undertake a risky plot to retake the ship, Mitchell rings aboard Netan's ship and is welcomed as Netan's ally, Kefflin. However, Teal'c is discovered and captured by Netan and tortured for information. Meanwhile, Netan addresses his suspicious lieutenants and orders that the traitor, Antaeo, and the Odyssey, his prize, be recovered. Just as Mitchell and Teal'c prepare to escape, Tenat arrives with word that the Odyssey has been found. Daniel, Vala, and Carter escape the ship's hold and retake the Odyssey by beaming Anateo into space. Tenat has recognized Mitchell, but offers his silence for a price, as the ships of Tenat and Netan arrive at Odyssey's position. Netan demands Odyssey's surrender, then he appears on Tenat's ship, ordering Tenat to fire upon his own ha'tak. Tenat obeys, only to discover too late that "Netan" is Mitchell, once again concealed by the Reol disguise. Mitchell and Teal'c are beamed aboard Odyssey as Netan returns fire and obliterates Tenat's ship. Odyssey completes repairs and makes its escape, safe for the moment, but now at war with the Lucian Alliance. The BC-304 ships have an emergency transponder, or subspace beacon, which automatically sends telemetry back to the SGC about 30 minutes after a distress signal is sent. Colonel Paul Emerson is killed. Each division of Lucian Alliance territory is controlled by one of Netan's lieutenants, or "seconds," including Gavos, Slaviash, Karug, Millic, Rameris, Anateo, and Kefflin. There are about 20 seconds overseeing operations including smuggling, extortion, racketeering, and trafficking in Kassa. With mounting dissent over Netan's leadership, there have been rumors of betrayal and possible mutiny among the seconds, and Netan's position as a leader hangs precariously by a thread. Earth and the Lucian Alliance are now officially at war.